We have settled into our new house and the daily ministry that I will be doing with the mission board office. Just because we are settled in, does not mean we are sitting back and doing nothing. The next two months we are presenting our ministry in churches and assisting other missionaries in their works. We will be in 13 different churches in 6 states during March and April. A few are one-day meetings and others are multi-day missions conferences. In the midst of these meetings we will also visit and help one of our BIO missionaries working with the Deaf in Arizona. 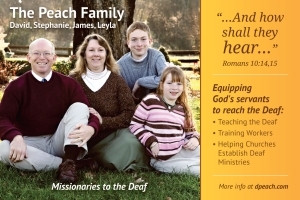 At the end of April we are going to a church in Maryland to help start a deaf ministry. As with all these types of meetings, we are praying that God will accomplish certain things. We need an inroad to the deaf community in the area. We pray that people in the church will learn the language well. And finally, we trust that the Lord will gift at least one person in the church to be a proper leader in this new ministry. It was a blessing to preach in a missions conference at a church near the BIO office recently. During this conference there were two young ladies who accepted the Lord as their Savior! I pray that as a result of this conference we will see new missionaries going to the field from this church. There are Deaf all around good churches who have no access to the Gospel because people don’t know how to share the Gospel with them. That number and need are even greater around the world. Wouldn’t it be great to reach the Deaf from many countries at one time? New prayer card coming soon! Stephanie and I do have an opportunity to reach an international group of Deaf this summer in Las Vegas. You may remember that in 2010 I traveled to Las Vegas with Silent Word Ministries to give out 60,000* 40,000 pieces of Gospel literature and DVDs to more than 20,000 Deaf from 73 countries. Still today we are reaping a harvest from that outreach. I learned recently that two more Deaf called in January asking questions about the literature we gave away. Both of them accepted the Lord through a video phone conversation! We need to raise $2,400 for both Stephanie and I to go. This money is in addition to our regular monthly support. If you will help with the trip please mark your donations for the Peach Las Vegas Trip and send them to BIO. Or, you can donate online at www.dpeach.com by marking your donation specifically for this trip. This outreach will have a huge impact on eternity. Will you invest in the salvation of Deaf souls? We covet your prayers as we continue to serve the Lord in the ministry to which He has called us.